In today’s world, one thing is certain: Energy costs continue to rise. Our mission is to assist businesses and individuals discover ways to save on energy while being kind to the ecosystem. We currently offer one product with several more in development. As far as energy evolution is concerned, we believe our Fuelade combustion enhancer is truly revolutionary. 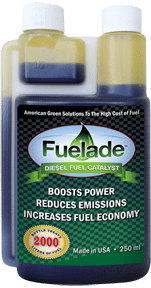 Developed currently for a wide variety of diesel fuel applications, Fuelade is gaining wide attention as an effective, completely organic emissions reducer and fuel saving formula. Learn more.